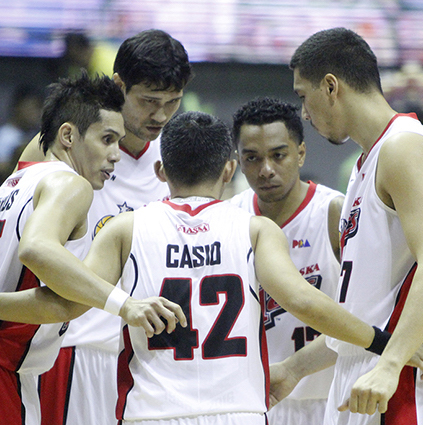 The Alaska Aces dominated the GlobalPort Batang Pier anew and booked their ticket to the Finals of the 2015-2016 PBA Philippine Cup after their Game 5 victory. The Aces led wire to wire in this encounter and simply outclassed their inexperienced foes. The Aces defeated GlobalPort for the fourth straight time to advance to their third Finals in the last four conferences. The Alaska Aces capped their mastery of the GlobalPort Batang Pier with a 118-89 victory in Game Five to finish off their semifinal series and advance to the SMART BRO PBA Philippine Cup championship round on Tuesday at SMART-Araneta Coliseum. Ping Exciminiano came out with his best game of the series, scoring 19 points and getting two steals to lead Alaska, which also got productive outings from Chris Banchero (18 points), Calvin Abueva and Sonny Thoss (14 each), Cyrus Baguio and Vic Manuel (10 apiece). It was the fourth straight win in the series for Alaska which, after dropping Game One, scored double-digit victories for the rest of the series en route to their third Finals appearance in four conferences. Alaska will take on the winner of the San Miguel-Rain or Shine semifinal series which is currently tied at 2-2. Jay Washington paced GlobalPort with 26 points, while the dynamic duo of Terrence Romeo and Stanley Pringle made 20 and 15 markers, respectively. Jay Washington (GLO) - 26pts, 7rebs, 1ast, 1stl, 3 triples.